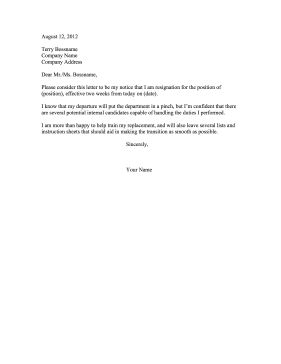 This printable resignation letter helpfully offers to help train the new replacement for the position. Please consider this letter to be my notice that I am resignation for the position of (position), effective two weeks from today on (date). I know that my departure will put the department in a pinch, but I'm confident that there are several potential internal candidates capable of handling the duties I performed. I am more than happy to help train my replacement, and will also leave several lists and instruction sheets that should aid in making the transition as smooth as possible.